howdy all, thanks for all the feedback. Now to rephrase the intent. I am looking for the items in the post so that I can start building a better costume. I realize I should have phrased my post differently. No one has given me any negative flac about what I have shot in thus far. Get contact information! Wait what? what I mean is as a new shooter its easy to get overwhelmed with meeting so many new people at a match. you leave feeling great but not knowing anyone's real name. This is important because just about everyone is willing to let you shoot or try out their stuff the day of a match, but reaching out in advance is a curtesy. It will let them plan on bringing extra ammo for you and even a few extra guns (some shooters have an extra set or two in the safes believe it or not ). This also lets you set up times to meet and shoot outside of monthly matches. Some ranges are only open to the cowboys on the day of the match, meaning if you wanna test guns, ammo, or gear you have to wait a month and that's Nooo fun. All this is to give you the opportunity to shoot as many different guns as possible before you find the ones you love! Very good to know. Is there any advantage to filling the space in the casing with something like when reloading black powder? Go! If you decide not to shoot that's not a bad thing. Going and volunteering is a great way to get exposure, get new gear at the swap meet, and see how the process works. There is always a need for helpers and more than likely before its all said and done, you will have guns in your hands shooting along with everyone!! Thanks all. I have been shooting in the local matches for a while and no one minds at all. My cover photo is my go to 'costume' for now. This is exactly what I was looking for! than you!! And from what I am reading its almost a null point. 125gr Lead RNFP in the 38Spl is 978 VEL. fps 125gr Lead RNFP in the 357m is 984 VEL. fps What I don't know is what the "CUP" is. From 16,900 in the 38spl to 11,900 in the 357m. What does this mean? One opinion- your hands and feet will move faster than you can think once your muscle memory takes over. Just like a roper throws a thousand loops on the ground before he saddles up or a pilot flies 10 simulations before actual take off you must put in the work prior to stepping on the stage if you want to be competitive. you must see yourself succeeding. 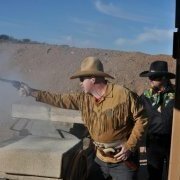 seeing the rounds hitting the targets, feeling the rifle set into your shoulder or the flick of your wrist to kick the shells out of your sxs. another great read is Becoming Supernatural. Your goal should be to achieve "flow" which is a natural state of being in your element where "mental" is not even a component because your physical is performing without you even thinking. Its like when you finish a stage and don't remember how you got to the end. everything worked exactly right without you even having conscious thoughts. Is it smokless or only blackpowder? Thank you for the check! !